We woke up in the fog of jet lag and rain the next day just as the first call to prayer from the nearby mosque rang out. 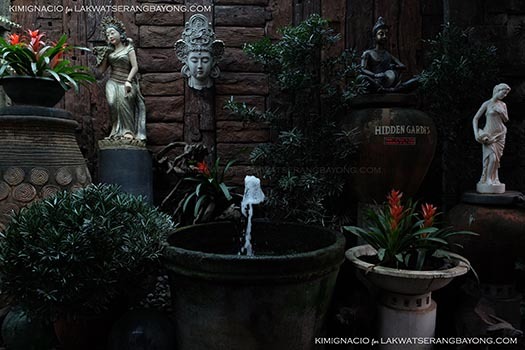 A place always has a distinct feel, smell and sound. Here, the sound is the Muslim call to prayer that rings out a few times in a day. It is melodic and powerful. I would always stop whatever I was doing to have a proper listen. It was still dark after 7 am and no movement can be detected from downstairs but then we were getting in desperate need of coffee so we bundled for the 18 degrees chill and woke Isham, the reception on duty. 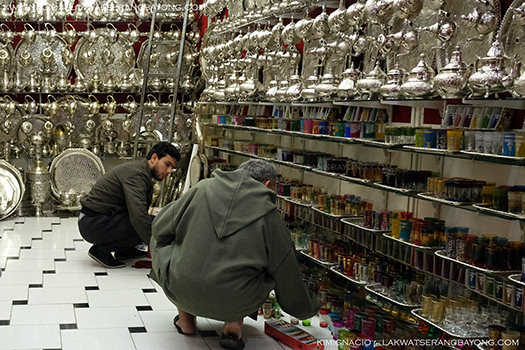 We’ve noticed that Moroccans start their day quite late. 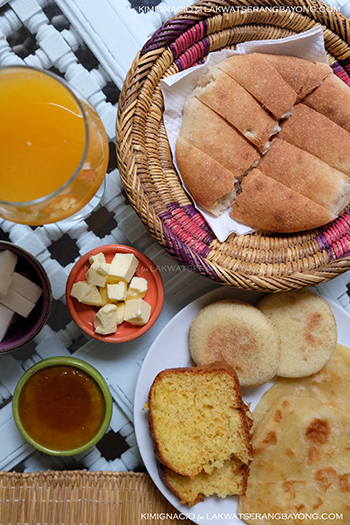 After a typical Moroccan breakfast spread of crepes, bread, cake, butter, jams, the most wonderful glasses of pure freshly squeezed orange juice, coffee and mint tea, we asked for indoor sightseeing recommendations as the rain hasn’t let up. We were supposed to hire a guide for a day to bring us to the medina and other places of interest but because of the weather, we decided to postpone it another day. 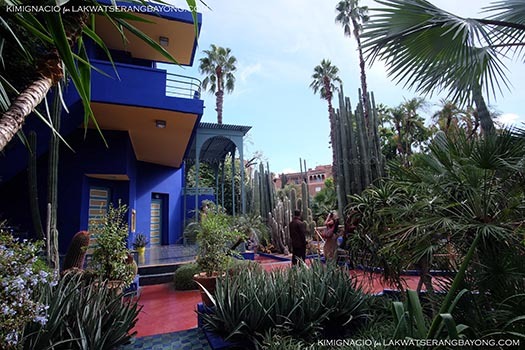 Yves Saint Laurent’s Jardin Majorelle was decided and just as we were heading there in our raincoats, the skies began to clear. It would rain on and off on that day but there were moments when the sun broke out. It is just our luck that when it pours, we are always sheltered or could easily find one. It did not became an issue and didn’t hamper our leisurely sightseeing. 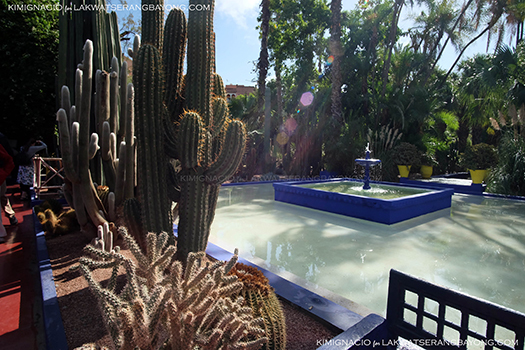 The blue garden in the middle of the red city is a nice introduction before diving into the chaos of frenzied Marrakech. 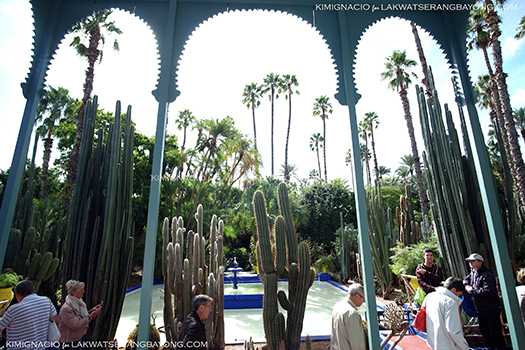 Peaceful shady lanes and gurgling fountain lined with exotic plants and towering palm trees. 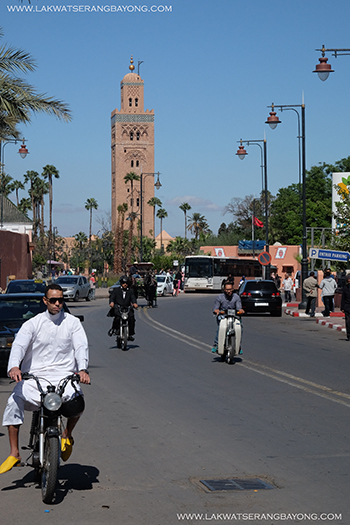 In the center is a vibrantly painted art deco building with Moorish charms. 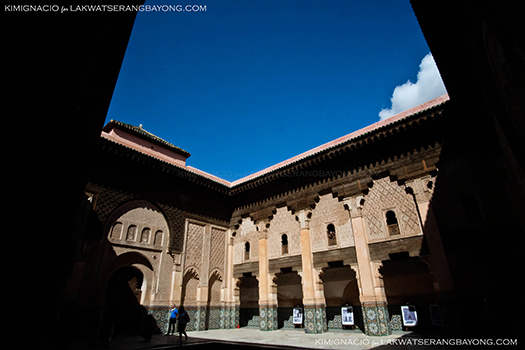 It houses the Berber Museum. The garden is open everyday with an entrance fee of 70 MaD + 30 MaD for the museum. Although photography is not allowed inside the museum, the displays are worth springing the extra 30 dirhams for. 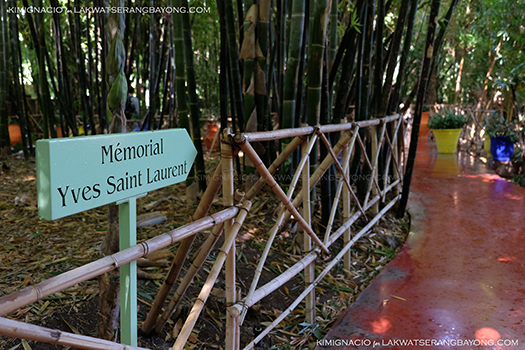 After YSL’s death in 2008, his ashes were scattered there. 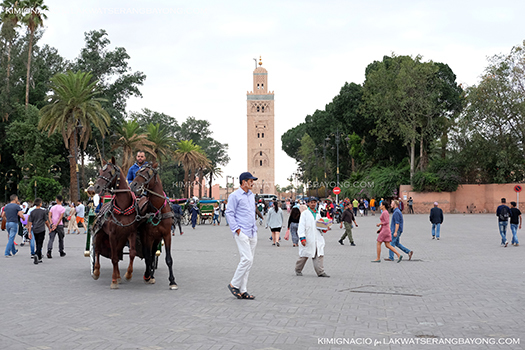 After a lunch of sandwich fromage, spicy beef couscous and glasses of chilled fresh orange juice at a roadside café outside Majorelle, we hailed a shared grand taxi to bring us to Ben Youssef Madrasa. 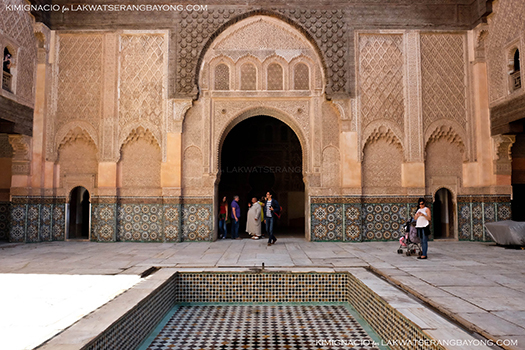 Founded in 14th century, the madrasa is a former Islamic college and the largest in all of Morocco. It closed down in 1960 and was refurbished and reopened to the public as a historical site in 1982. 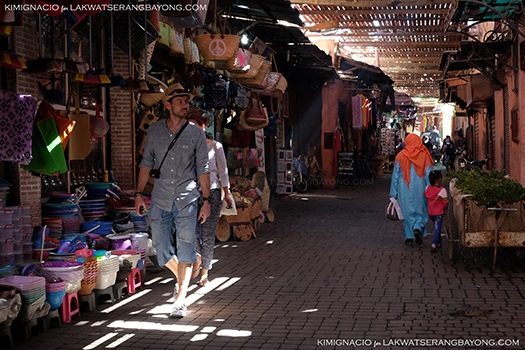 Ben Youseff is in the midst of the souks (open air market place) in the medina and because of the narrow winding alleyways, it cannot be accessed by cars. The taxi dropped us of the outskirts with vague hand gestures to go right in. “Very easy. Go straight, turn right, straight, straight, right, left, very easy.” We were skeptic and might have stopped listening after the “turn right” part but what the hell, we dove right in. The word labyrinth in describing the medinas could get overused, but it is just apt. One foot in, one turn and you are in a zigzagging maze. We have terrible sense of direction to begin with so we’re prepared to embrace getting lost in the maze. And even if we happen to be good withs maps, medinas are the sorts that defies maps. Google and Waze got nothing on its twists and turns. 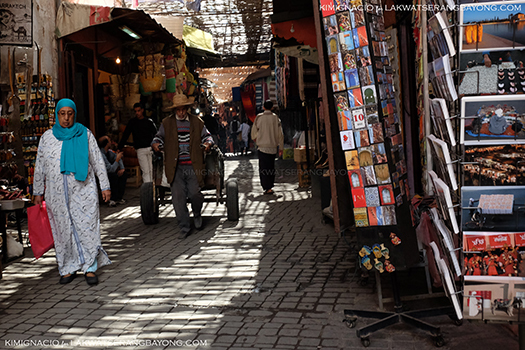 That would have been frustrating anywhere else, but in the treasure filled souks, it is part of the fun. 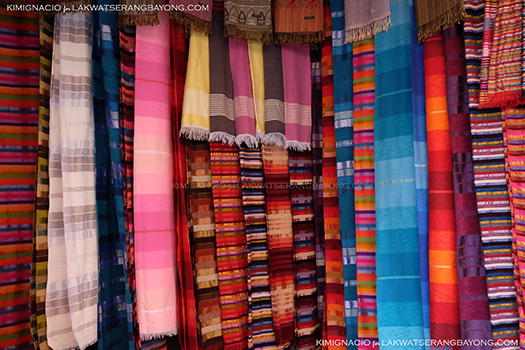 First day in and I was already wondering how many handmade Moroccan goodies can I fit in our suitcase. After all that we’ve read about the shopkeepers and touts, I’m surprised they aren’t too persistent and if we politely decline and thank their offers of getting into their shops to “just look”, we get a “shukran” (thank you in Arabic) back. 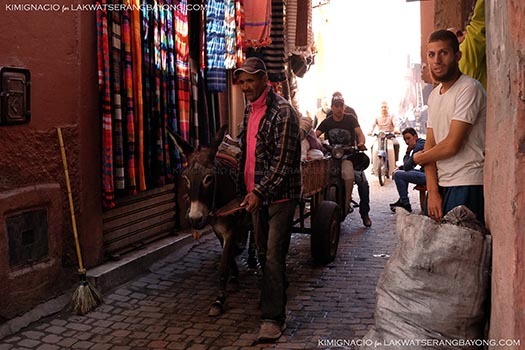 You’ll read a lot of tips and tricks for visiting the medina, but this could be the best travel tip I can dish out. “No open toed shoes.” Donkey pulled carts. Donkeys. Donkey dungs. And when you hear urgent warnings of “ba-lak, ba-lak” in the cramped alleys, move right away or risk the real possibility of getting squashed by donkeys, and or carts. 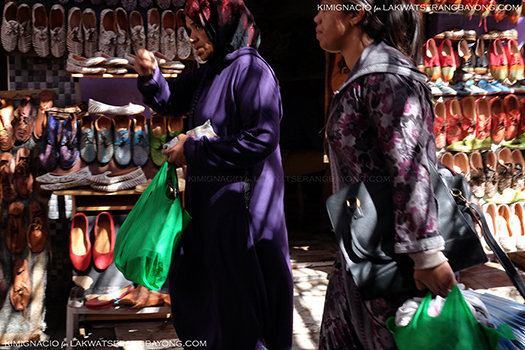 We kept getting waylaid with pretty handmade things but at one turn, in our aimless wander, we actually found Ben Youssef. 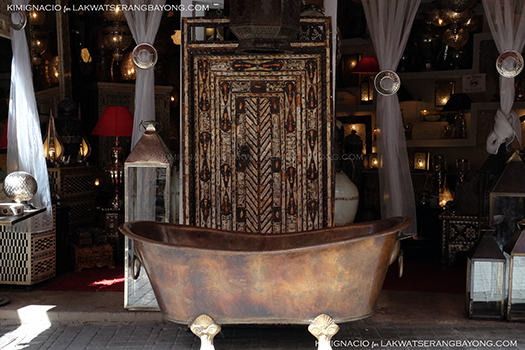 We excitedly paid for the 20 MaD entry fee per person and marveled at the exquisite craftmanship and zellij mosaic tiles. 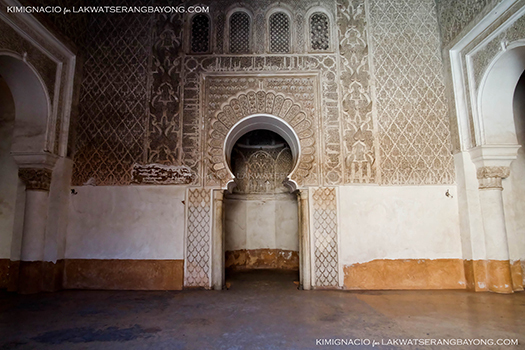 We probably spent some 45 minutes to an hour there exploring the area and marveling at the intricate structure. 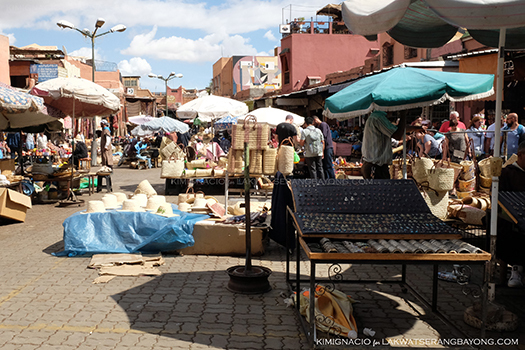 We’ve walked off lunch by then and was getting hungry so we made our way out with the intent of finding the square – Djemaa El Fna. We followed the signs but the last one at the corner was scraped off. Several locals then pointed at several directions and one guy kept following us muttering “the square, the square”. We thanked him as we refused his directions and company but he stuck stubbornly to our side. This went on uncomfortably for a few blocks even when we pointedly ignored him that when a taxi passed by, we hurriedly got in it. That’s when he got kind of aggressive and slammed the cab door prompting a shouting match between him and the driver while we sat at the back a bit shocked. I was on the verge of crying! I know it is different for everyone and we weren’t really hurt but it got frustrating for me and disappointing how there seems to be a collective effort from a few to mislead tourists. Get a guide if you can. 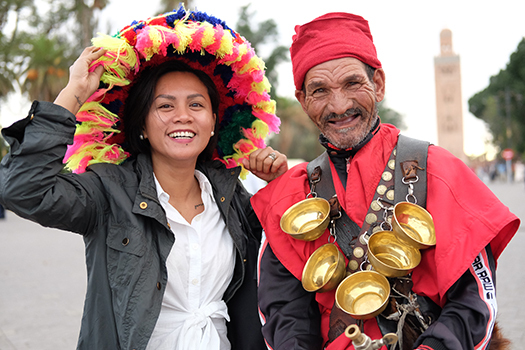 But that incident was soon forgotten as we got to the infamous Djemaa El Fna. 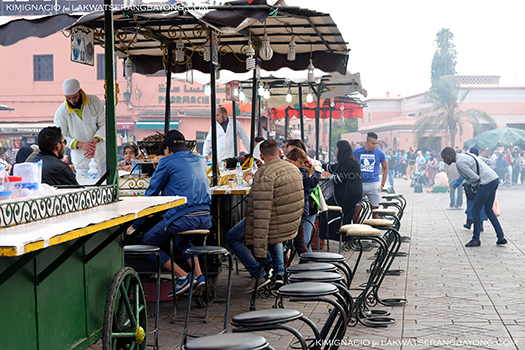 On the surface, the square is populated with a massive market, identical carts of freshly squeezed fruit juice vendors, veiled henna ladies who will grab your hand and paint on without warning, smoky food stalls, traditional water sellers and mobs of locals and tourists. We avoided the monkeys on leash and the snake charmers. It is a chaotic frenzy with so much going on! It is exciting and filled with interesting bits of culture. 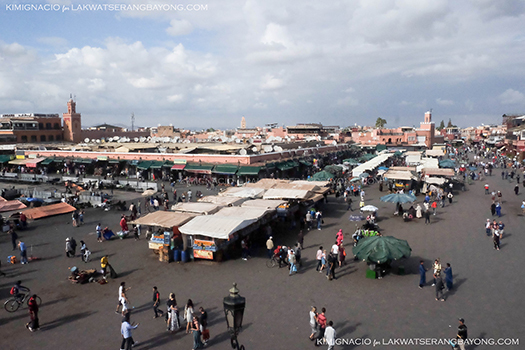 This is the Marrakech most people expect it to be, us included. We sat there with cold drinks and pizza at one of the terraced restaurants content to watch and soak it all in until the lights changed. After an almost 30 hour transit from Manila via Qatar Airways with a layover in Doha, we finally struggled out of Menara International Airport. 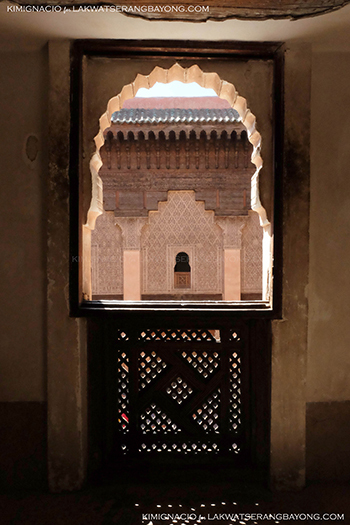 Utterly exhausted but couldn’t be less excited to finally set foot in one of our dream destinations – Marrakech! 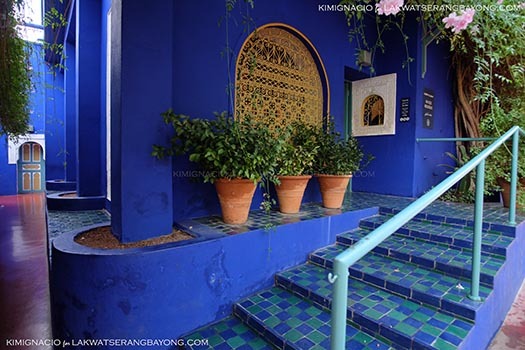 We’ve been looking forward to this trip since last year when we stayed at Hotel Figuerroa in Los Angeles (California) and was floored with its Moorish architecture and charm and decided right there and then that we are going to Morocco for our next trip. I am so happy we’ve made it happen! 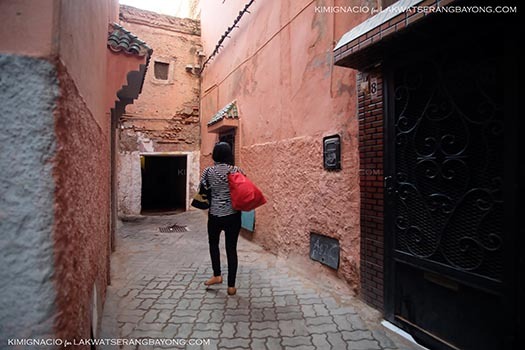 We have over 2 weeks to explore the country and with the long haul flights, we have simple plans on our first day – check in, grab our first Moroccan meal and finally sleep on a proper bed. Pretty straight forward! And so we think. Armed with a crude map drawn by Youseff - our bearded but soft-spoken riad receptionist, we set off to find dinner. The directions looked easy enough to navigate and follow. We were ok for a few meters in the winding medina until we came to a fork in the road and hesitated to consult the map. That’s when a gang of kids mobbed us! They persistently offered to lead the way and cannot be shaken off. Fresh off the plane dog-tired and on a different timezone, this is the last thing we want to encounter - a scam we've read so much about. We knew this scam but they still managed to get me lose my bearings, intimidate us and had us turned around. (Kimbee says to speak for myself). I blame it on exhaustion. Their numbers were growing by the minute and when I asked the ladies or the shopkeepers for directions - which is supposedly how to get around that scam - they would tell us to just go with the kids. 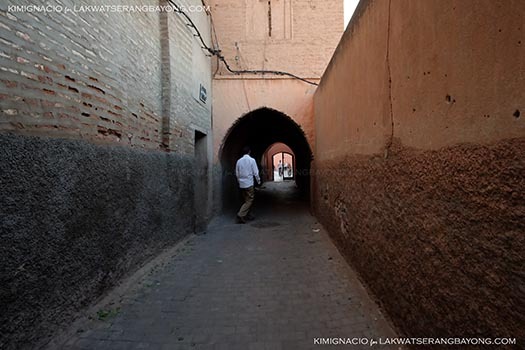 That’s when we decided to just go back to our riad, but even then, the kids were trailing us, sometimes even blocking our way. 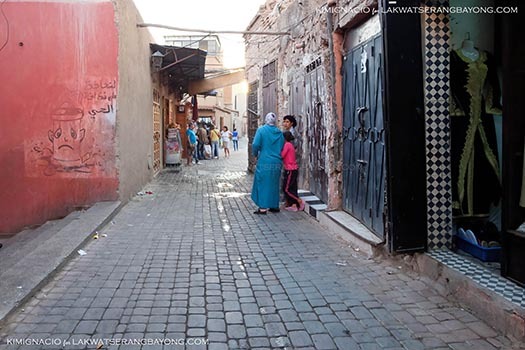 When we’re almost to our door, they figured which riad were we staying at and collectively started chanting the name of our accommodations like they led us there and started demanding money. When Youseff opened the door and saw us surrounded by the kids, he instantly realized what just happened and started berating them in Arabic. They left but not without ruckus and some half hearted attempts at throwing stones at the wooden door. What a welcome from these little rascals! We were resigned to eating whatever we could find in the immediate vicinity as we’ve passed some stores nearby but Youseff took pity on us, locked up and brought us to Riad Edwards himself and arranged for his brother to bring us back after dinner. 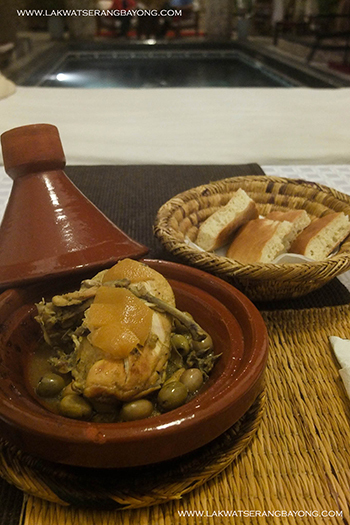 Finally we’ve found our first Moroccan dinner of really tender juicy chicken tajine in orange and olives with dense chewy bread and a glass of Marrakech’s famous orange juice. We dined by the poolside in a beautiful courtyard with air perfumed of citrus. 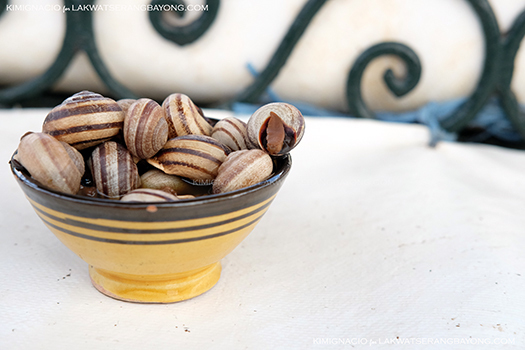 It was worth the trouble and quite possibly our favorite meal in Marrakech. 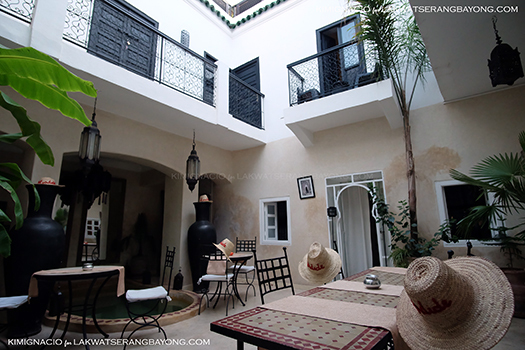 For 3 nights, we booked our stay at Riad El Jadide at the medina. 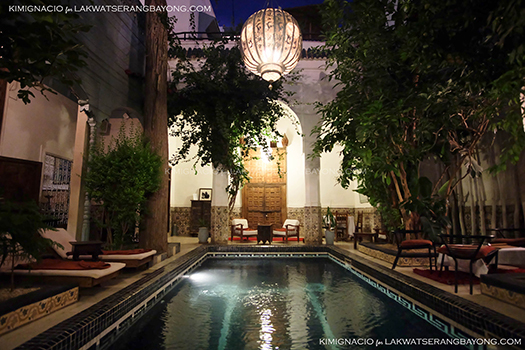 A riad is a traditional Moroccan house, or sometimes even a palace (!) 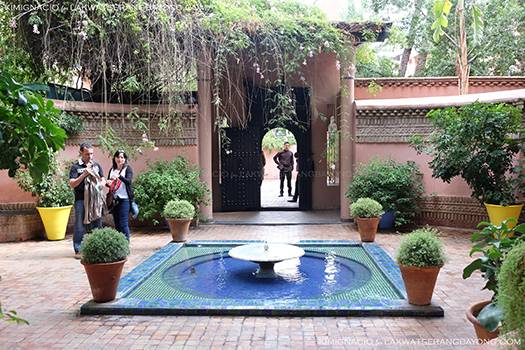 with an interior garden or a courtyard. 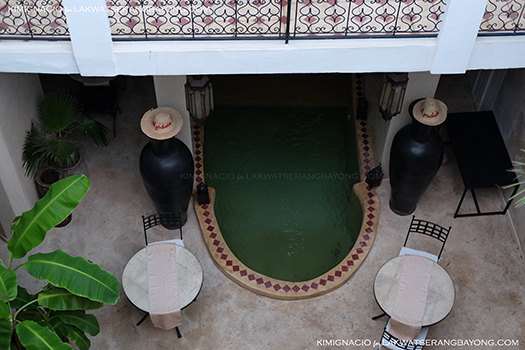 Ours came with tiered terraces, cosy bhous (seating nooks) and a rooftop that encourages lounging. Definitely historic and authentic. 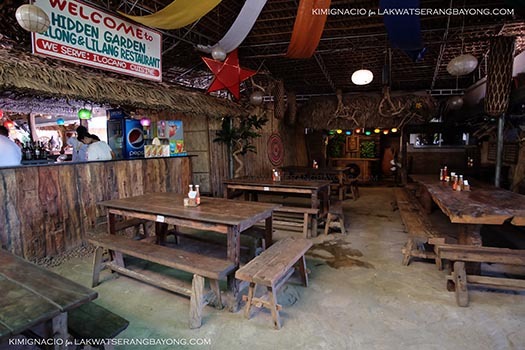 Our Ilocos trip wasn’t exactly done on a whim. 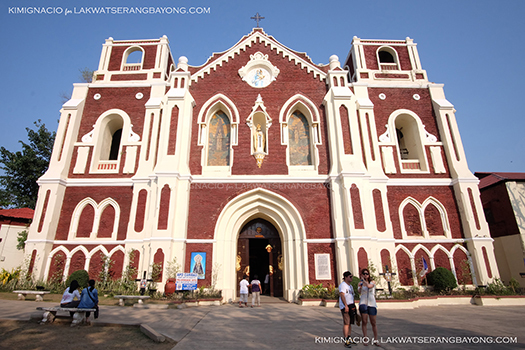 We’ve been wanting to explore more of the region and when we had to go to the capital for a family’s wedding, we extended our flights to squeeze Ilocos in. But then work ensued that even at the day of my flight I still wasn’t sure if we could do it, let alone attend the wedding. The universe though conspired that at the last minute I found myself haphazardly putting on make up on my economy plane seat. Changed my jeans and sneakers campaign uniform into a modern Filipiniana wedding guest outfit in a cramped plane bathroom and hit the ground running from NAIA to Manila Hotel. Our crazy schedule left us with no time to properly plan the trip so we just winged it. It did work out in the end and although I’d like to believe that we’ve somehow become seasoned lacuacheras over the yeas, this confirmed that we are far from the spontaneous kind of travelers! 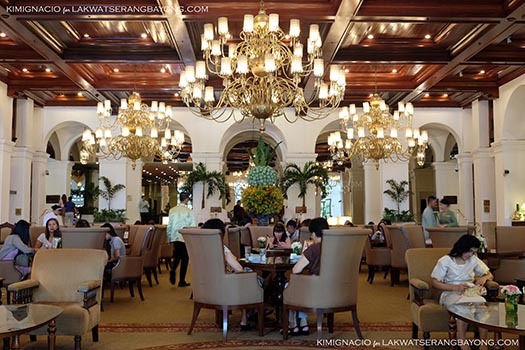 Although it made for some travel highs getting surprised from time to time, we were also mildly stressed out not having pre-booked accommodations and excel planned itineraries knowing we were probably missing a few stops. We’ve gotten boring, I know! But whatever, different strokes for different folks. We left Sampaloc bus station for Vigan at exactly 1030 PM via a Florida non-stop super deluxe overnight sleeper bus. 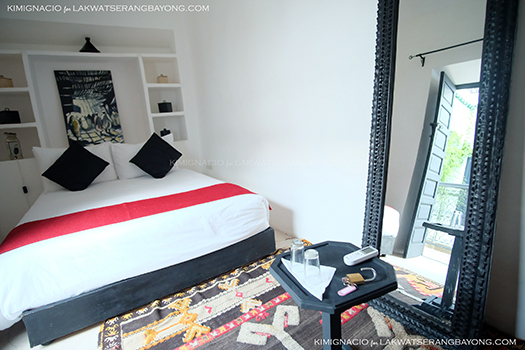 Fare is around P750 per person per bed. The bus was clean and air conditioned with a cramped but clean toilet on board. Pillows and blanket were not provided so dress in layers as the bus can get cold. 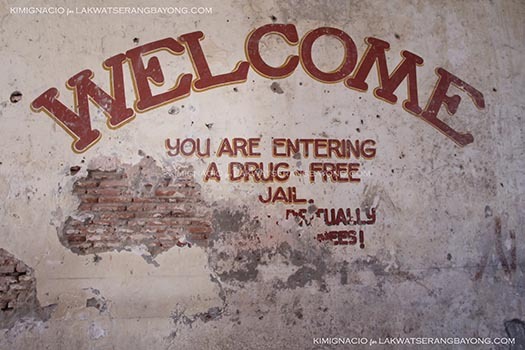 Travel time was around 5.5 – 6 hours and in a crisp summer morning we were deposited on the highway of Bantay at 4 AM. 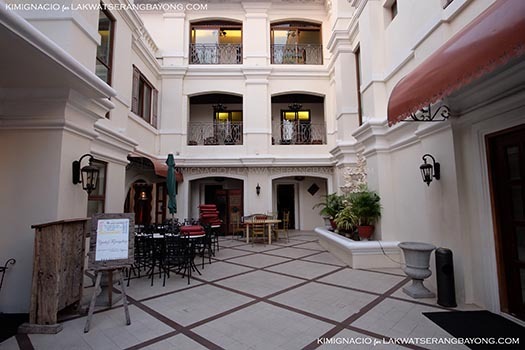 From there we hailed a tricycle that brought us to the 100 year old Ciudad Fernandina Hotel. A stone’s throw away from the famed Calle Crisologo but still removed from the heavily trafficked area so it wasn’t noisy. Our room and breakfast wont be ready before 7 AM so we deposited our bags at the reception and walked around wrapped in cardigans. The cobble stone streets of Calle Crisologo is lined with Spanish style heritage homes and shop houses from a bygone era. Vigan is a UNESCO World Heritage City and it is magical at dawn still empty of tourists except for us and a few sleepy tricycle and calesa drivers and the occasional joggers. Sunrises and being up this early for these sleepy heads is a huge deal so we get a top up reward – pre-breakfast of a still warm cup of taho. Taho is a Philippine snack of silken tofu sweetened with a dark sugar syrup called arnibal and tapioca, peddled on streets. 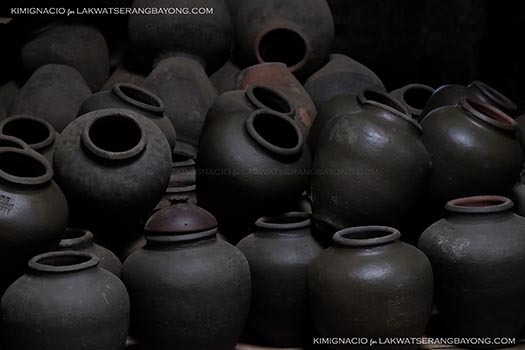 When it was light enough and more people have flocked the streets, we walked back to our hotel to a proper breakfast of garlicky vigan longanisa dunked in pungent sukang Iloco. And then we crashed on our hotel bed and was out like a light until lunch. I get to chat up a tricycle driver on his morning jog and we arranged a half day tour with him at lunch time. After showering and grabbing some freshly baked Spanish bread at the corner Panaderia, we met up with Manong Noli (09263118474). 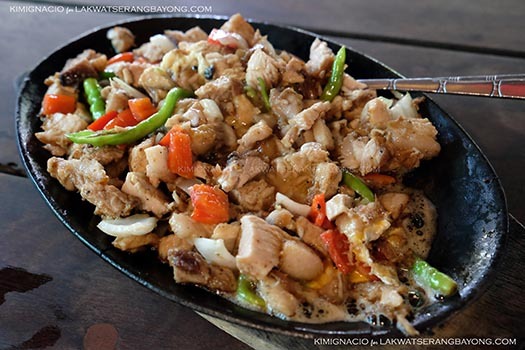 First stop was a pinakbet and sizzling bagnet lunch at the Hidden Garden. 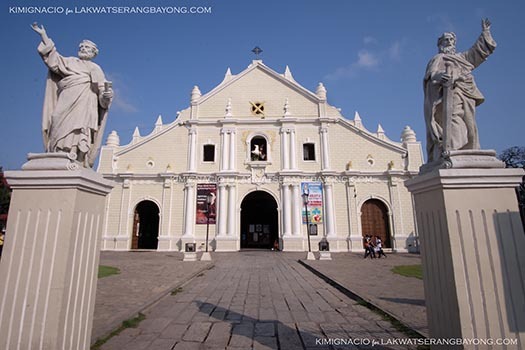 Vigan is rich in culture and history and sights, so after a filling lunch we pressed on. 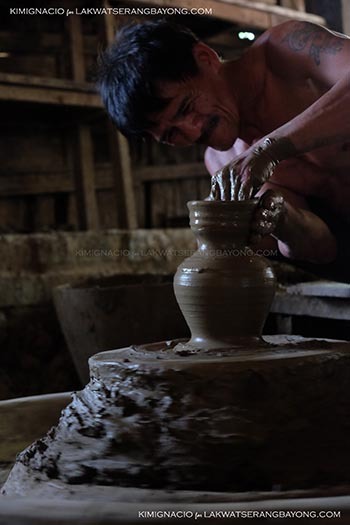 From there it was a short drive to Pagburnayan Pottery where I get to try forming, or more like, deforming a vase at RG Jar Pottery. 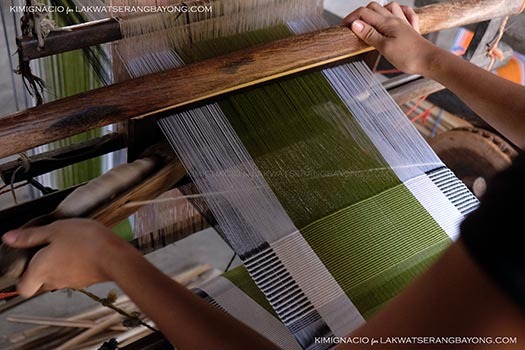 My parents would bring home suitcases of Abel Iloco after every Ilocos trip so that was our next stop. 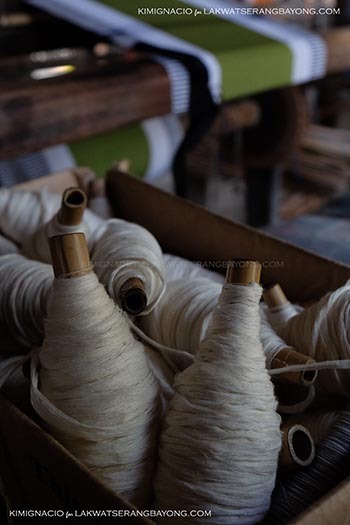 I am so turning into my mother and we brought home a beautiful red and white striped table runner and a white blanket from Cristy’s weavers after touring the backyard facility. The sun was fierce at that point so we headed indoors to the Syquia Mansion turned museum to house Pres. Elpidio Qurino’s memorabilia. Pres. 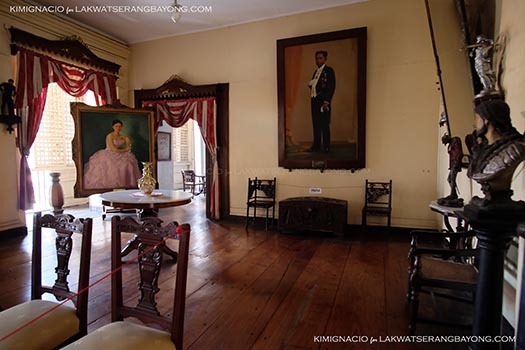 Quirino is a Vigan native and the 6th President of the Philippines. 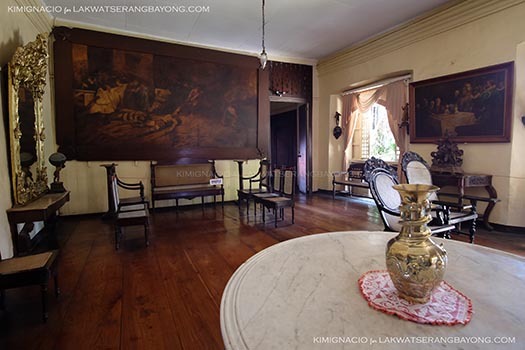 The mansion is the ancestral home of his wife, Doña Alicia Syquia Quirino and the 4th generation Quirino's (prolly along with some ghosts) still reside at the mansion. 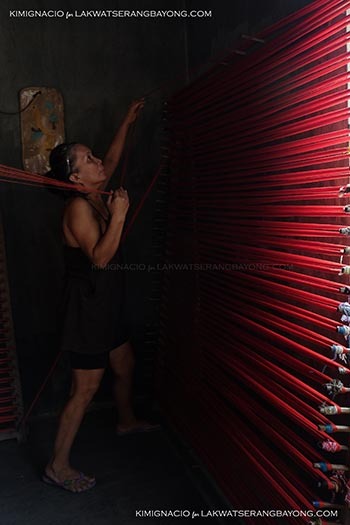 Open to the public for an admission fee of Php30.00. 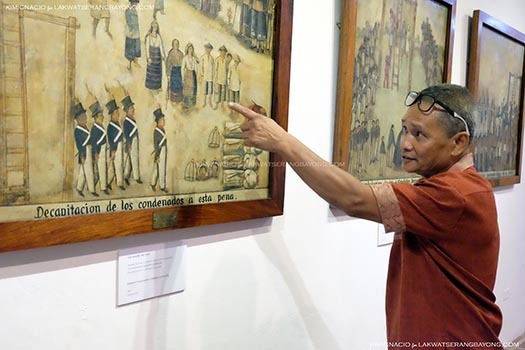 The museum tour continued at Crisologo Mansion and Ilocos Sur Provincial Jail also turned art center under the National Museum of the Philippines. The latter was under renovation during our visit so we only got to see the Basi Revolt exhibit. 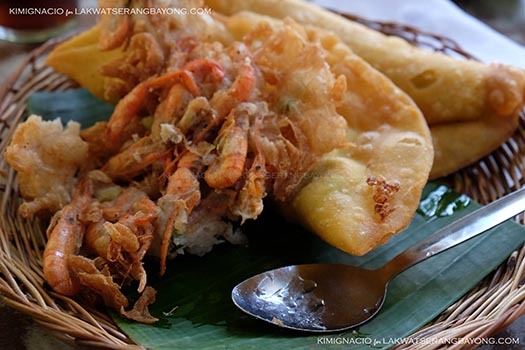 The tour was briefly interrupted with delicious snacks of Okoy (fried shrimp fritters) and Empanadas (pastry stufed with meat, veggies and eggs over easy) at the edge of plaza Burgos across Vigan’s cathedral. 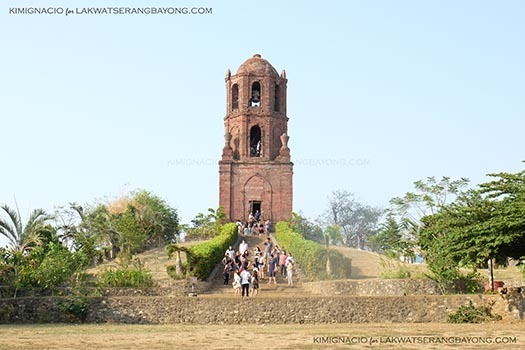 Stuffed, impressed, and eager to see more, Manong Noli brought us to Bantay Church and Bell Tower. Church was also under construction, so after taking photos at the bell tower and cooling off with popsicles, we headed back to Calle Crisologo where we then promptly boarded a calesa to quickly circle the centro and for the experience. Capped the full day with dinner at Café Leona, at one end of Calle Crisologo right off the plaza.